All the candidates can check here General Knowledge Questions Tricks for all type of Competition examination. Candidates get latest information about the GK question answers tricks for all the Govt. Recruitment Examination. It is very useful for all the candidates which are preparation for the Govt. sector Jobs. Candidates can remember all the GK short tricks for long time. Here you can check all the GK short tricks related to Major developments in India by Babur, Mahmud Ghazni time scholar, Moment of Mahatma Gandhi, Harappa civilization and more. Candidates get all the GK answers tricks from here related to many govt. sector exams like RPSC, IAS, RAS, FCI, CLAT, SSC, UPSC, MAT, REET, Patwari, Gram Sevak, NDA, CDS, AAO, LIC, IBPS, Police, Forest Guard, Railway, AAI, Clerk. Candidates get all the latest and important updates related to GK Tricks in Hindi from this page. 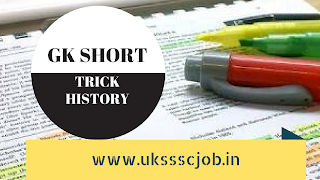 You can visit this site www.ukssscjob.in time to time. कनिष्क के दरबार के प्रमुख विभुती कौन कौन थे ? गुलाम वंशीय शासक 1206 – 1290 ई. If you want PDF version Of These Short Tricks. Follow us on Google Plus and Follow by mail option.